A herb garden is a quick and satisfying way to start an edible garden. It doesn’t matter if you have an acre or a windowsill, anyone can create a herb garden to be proud of. Fresh herbs add extra flavour to your cooking, but what most people don’t know is that they are also full of antioxidants and nutrients that will boost your health too. Over half of the nutritional value is lost within 30 minutes of the herb being harvested, so the only way to get the full benefit is to grow your own. Firstly you need to decide where you are going to place your herb garden. Ideally, your herbs should be grown near where they will be used - the kitchen. Consider locations such as a kitchen windowsill, just beside your backdoor or in a section of your back garden. Herbs need high quality soil with good drainage but they are not as demanding as vegetables; so do prioritise the best spots for your vegetable garden. Like most plants, herbs like at least six hours of sunshine a day and good shelter from the elements. If you are going to plant your herbs in pots, make sure to use deep pots with good quality compost. The pots should have decent drainage holes to allow extra water to drain away, as herbs don’t cope with excess water well. If you’re new to gardening, we recommended you try growing from seedlings as opposed to seeds. Seedlings are widely available in stores and allow you to skip the complicated task of planting seeds. However, seedlings do tend to be more expensive than seeds to buy. You can sow seeds indoors in small pots and when they are ready, transplant them either into bigger pots or out in the garden. There are many different types of herbs and many varieties of each type. Start with the herbs you know and are fond of as you will be more likely to actually use them in your cooking. Some of the popular choices would be rosemary, thyme, parsley, sage, basil and fennel. Rosemary is an aromatic, evergreen herb that not only smells great, its beautiful appearance makes it decorative too. From the mint family, it is a fantastic flavour to add to lamb and chicken dishes. This herb also contains iron, calcium, and vitamin B6. 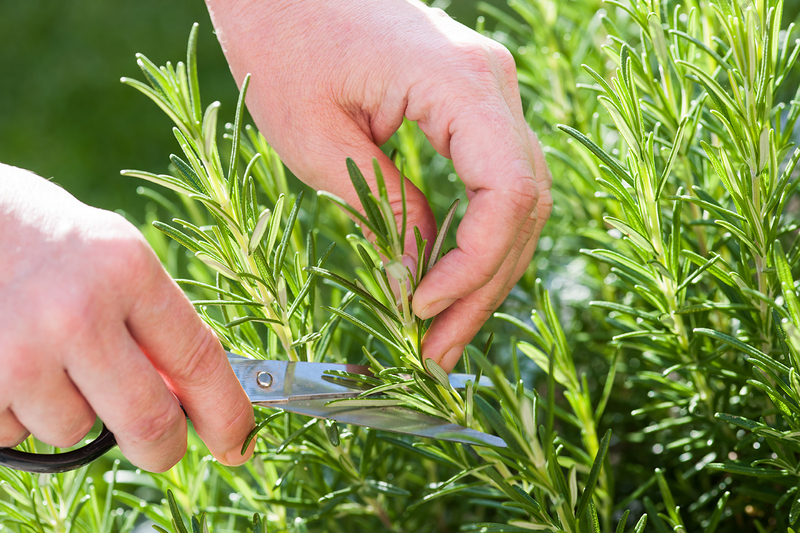 Your rosemary will thrive if it gets plenty of sunlight and water with good drainage. Thyme has an uplifting and refreshing scent and an attractive appearance. It is often used as a herbal remedy for respiratory problems and contains antiseptic properties. Thyme will add oomph to the flavour of soups, roasts and salads. It is compact in size, which makes it suitable for indoor growing, but it does need plenty of sunshine. Parsley is widely used as just a garnish but it is actually very nutritious. It contains high levels of vitamins K, C, and A, as well as iron and more vitamins and minerals in lower amounts. It is a biennial plant, which means it needs two years to complete its lifecycle. When one parsley is about a year old you should plant another; like a relay system so you will not be left without. It requires a deep bed, and plenty of sunshine and water with good drainage. Sage is aromatic, packed full of antioxidants, and it has antiseptic properties too. It makes a delicious addition to stuffing, and roast meats and vegetables. It’s a hardy perennial that is ideal for beginners, but it does need plenty of sun and excellent drainage. Sage will often need to be staked as it grows larger too to support its height. Basil is a tasty addition to almost any meal, and it is a good source of fibre. It also has a detoxifying effect on the liver. Basil is a hardy, annual plant that grows easily both indoors and outdoors. As with most herbs, it needs sun and drainage, and may need watering every other day depending on its location. It also needs shelter from frost and wind. Fennel is a hardy, perennial plant that is one of the easiest herbs to grow. It will survive in almost any conditions in Ireland but it does prefer sun and drainage, like the rest of our selection. It has a liquorice-like flavour that is an excellent seasoning in soup and fish dishes. It is a natural deterrent for fleas, for those with pets; and it is also an ingredient in many natural remedy recipes. Label your herbs just in case you can’t remember what you planted. It happens to the best of us! As soon as your herbs have matured, start harvesting them. Harvesting your plants will promote growth. When harvesting your herbs, take just a little at a time. If you remove more than a third of the plant in one go it will take it longer to recover and produce more leaves. Herbs taste best when harvested first thing in the morning. Herbs are ideal fresh but they can also be dried or frozen. This will allow you to enjoy your herbs all year round. Herbs grown in pots will need regular watering as well as feeding. And finally: enjoy! Use your freshly grown herbs in your cooking and make sure everyone knows that you grew that flavour yourself.